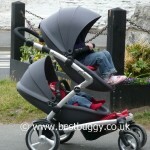 Here is a collection of photographs of us out and about with the Mima Kobi. I have to say that we didn’t get much of a reaction from passers by which surprised me as the Mima Kobi is unusual, but that is actually good because the Mima Kobi seems to fit well into every day life. 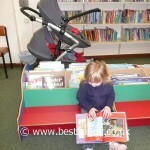 We went to the park, the library and supermarket. The handling was superb the whole way, and kerbs were no problem. 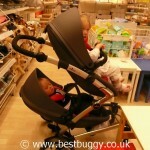 The baby fell asleep within minutes of leaving home, and it was easy to silently & smoothly recline him. The 2.5 year old wasn’t sure about being so high up, but a baby growing up would be used to the high position and the seat. I think she was glad of the bumper bar to hold onto even though she was comfortable in the seat. As I have put elsewhere, the Mima Kobi stood up to my daughter rocking in the front seat with barely any movement at all. However my son was in a perfect position to kick his sister from underneath and annoyed her successfully – but he is at the age where all he wants to do is to stick his feet in the air, pull his socks off and play with his toes! I am sure it would be a short term issue! When the baby woke up he loved the view out of the back. Although the upper seat blocks the front view, there are no sides as such to the seats offering a great view out at either side. I have never seen him looking around so much. 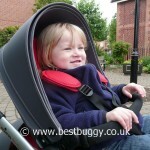 When putting the baby into the lower seat, the hard hood is a bit of an issue (I reclined the seat as I do with most tandems with a lower seat, but I also removed the hood – it is quick and easy to take off and put back on again). 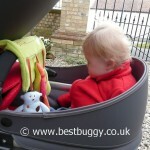 However when out and about I liked the fact that the hoods did not fully retract, because my daughter in particular prefers to push the hood back, but in the Kobi she still had some shelter from the wind. As mentioned elsewhere, a little more storage would have been appreciated. Some items fell out of the shopping basket on the way home, and the library books pretty much filled the basket. I tried to balance a bag of shopping at the front of the basket but realised that my daughter could kick it off. 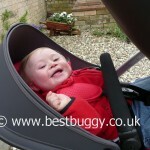 If I take a pushchair to the shops, I do like it to carry my shopping home for me! 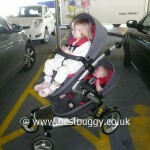 After taking the Mima Kobi out and about, I am finding this is a pushchair that has good looks, but is also very practical. 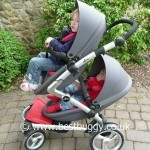 For me, the ease at which I can push two larger children around, makes the Kobi stand out as one of the easiest tandems to push on the market. For me this is important as I developed back issues in my first pregnancy and with some pushchairs I find that half way to the shops my back starts to ache. 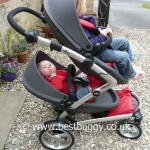 But the Mima is well balanced, drives with very little force, the handle height is good, and the handle shape is comfortable; and I did the journey to the shops and back with no aches or pains. 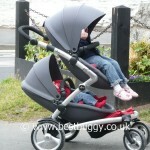 We have had some lovely outings already with the Mima Kobi and look forward to a few more this week. 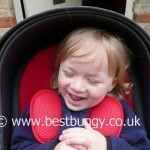 The Mima Kobi really is a pleasure to use and comfortable for both children and adults. 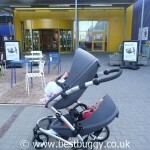 For the first time ever I braved Ikea without Mr BB with both children. I could have taken a pushchair with a large basket, but I did not. 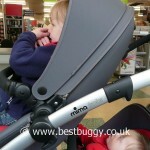 I wanted to see how the Mima Kobi was to handle on my own and whilst shopping. I have to say I did wonder what I was letting myself in for! Getting the Kobi out at Ikea was fine. I had popped off a couple of wheels (we had a boot full of bags, scooters, helmet, gifts etc from a day with relatives), but I managed easily to put them back in place. I woke my sleeping baby son up during the transfer from car to Kobi. 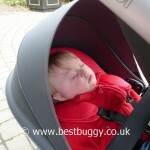 It was not easy to slide him in past the raised hard hood – lesson learnt – put the Kobi hood on after a sleeping child is seated! I have to say there were a lot of heads turning and comments about “look at that” as we walked around Ikea. 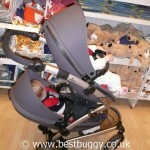 I was worried about how I would cope pushing the Kobi and carrying / selecting shopping, but the Kobi was incredibly easy to push one handed around Ikea, and I did our shopping successfully. The check out process was a little more challenging because I had to try and balance various items in the Kobi basket, but I managed it. Back at the car, I admit I was wondering how I would get the Kobi back into the boot. But with a pile of items to one side, and with two wheels popped off again, it was actually surprisingly easy to slide the Kobi back in the boot again. Mission accomplished and all done in style!